Photo: Richard Henneberg and Frances Pressner, abt. 1911, Bronx, New York. Digital photograph. Privately held by Thomas MacEntee [ADDRESS FOR PRIVATE USE], Chicago, Illinois, 2009. Last month I posted about how after many years I was able to break through my Pressner brick wall and I wanted to bring my readers up to date on some more breakthroughs involving my Pressner and Henneberg lines. Anna May Henneberg (1912 - 1965) was my maternal grandmother who lived in the Bronx, New York and died in 1965 - thus I don't have many memories of her or her family. Anna Henneberg's parents were Richard Henneberg (1988 - 1941) and Frances Pressner (1889 - 1960) and for years I was unable to identify the parents of Frances. I've been working with my 2nd cousin Wendy who I met on Facebook and we've been sharing Henneberg and Pressner data for months now. We also both have our family trees posted on Ancestry so we can keep tabs on each other's progress. Wendy also is the one who has been handling requests with the New York City office of Vital Records to obtain death and marriage certificates. She and I have been using Stephen P. Morse's One Step website to identify the exact certificate numbers and then she takes care of placing the order. And then the waiting and waiting takes place. Remember what it was like to get something fun in the mailbox? Well Wendy knows that and the anticipation involved - she says it is exciting and she can't wait to see which mysteries will be solved when the certificates arrive. Well Wendy hit the jackpot last week. 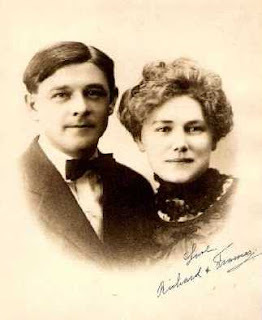 The marriage certificate arrived for Richard Henneberg and Frances Pressner which revealed the name of Frances' parents (Robert Pressner and Anna Herring) as well as confirming the maiden name of Richard' mother (Zwicker). Also key were the names of the witnesses - Adam and Julia Beyerman. Subsequent census searching revealed that Julia was in fact Julia Pressner and the sister of Frances Pressner. And if that were not enough, further research of census and immigration records has brought us the name of Robert Pressner's parents (Johann Pressner and Franciska ______ from Austria) as well as Anna Herring's parents (Albert Herring and Emily _____). By getting copies of the marriage certificate and then supplementing it with further research, my cousin and I could add two more generations to our family tree. As a side benefit, I've gotten Wendy interested enough in genealogy (and she is so good at the research) that she thinks genealogy might be a new profession for her! Leaving no stone unturned, getting out and doing non-Internet based genealogy research, and being persistant is the key to breaking through those brick walls! Congrats, Thomas! See, I TOLD you to get that marriage certificate! Did your great-grandparents really autograph the photo? It's a good one. Your great-grandmother is really beautiful! Yes that really is their autograph - I think they may have used these photos as "thank yous" for those who attended their wedding. And you were right - the marriage certificate was the key!